At its peak, the panic caused by the Ebola outbreak left health officials in affected countries clambering to both contain the situation and dispel myths about how the disease spreads. But one country clearly remains almost overtly paranoid about the epidemic — North Korea banned foreign marathon runners over Ebola fears, despite its geographical location being thousands of miles removed from the epicenter of the outbreak in West Africa and no reported Ebola cases in the country itself. Our North Korean partners in Pyongyang contacted us this morning with news that the 2015 Pyongyang Marathon has — as of today — been closed to amateur and professional foreign runners. We were told that this is due to the ongoing precautions that the country has put in place in relation to fears held there over the Ebola virus. The marathon cap is in line with the isolated country's especially strict travel restrictions over the fear of Ebola. Introduced in October, the restriction required foreign diplomats and aid workers, regardless of their countries of origin, to be quarantined for 21 days. That the North Korean government maintains such a high level of paranoia is not surprising (it also foments fear among its population for the outside world); what might seem surprising, though, is that the hermit kingdom holds a international marathon that accepts participants from other countries. The capital Pyongyang has held, for the most part, the annual marathon since it began in 1981, but only last year was the event actually open to foreigners. Beginning and ending at Kim Il Sung Stadium, the marathon's course loops around Pyongyang city and offers 10 km (slightly over six miles) and half marathon races, as well as the full course. According to The Guardian, last year's race that was made available to foreigners was a big success. Despite deep distrust for the outside world, North Korea has, in recent years, made a concerted effort to sell itself as a tourist attraction, particularly to China. Last month, Chinese officials announced that the country was making plans for an international tourism zone with Russia and North Korea that visitors can access sans visas. 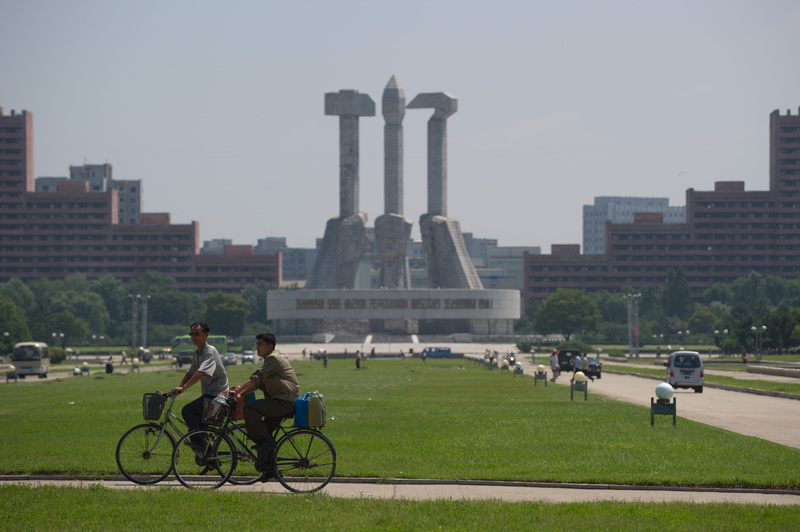 Pyongyang's most recent travel restrictions, however, have deeply affected travel agencies. It's unclear why the government is exercising such superfluous caution over Ebola, though the state media's suggestions that Ebola was created by the U.S. military as a biological weapon could hint at the rationale behind its decision.